You can search for a wide variety of crochet tablecloth patterns on the internet. Crochetpatterncentral.com is a good place to start. Your local library also will have a selection of craft books. This is a guide about finding round table cloth crochet patterns. Looking for a crochet pattern for a round tablecloth that has a pineapple design. If you have your heart set on the big one, great. But here is another idea that you might like. It has been well received when I have posted it before. One, you can go to the Dollar Tree and get new doilies for sometimes 2/1.00. Then, you can simply whip stitch them together at certain points and keep going. Two, you can get second hand ones at thrift shops and sew them together. Your table will be covered by some very unique work, and you can be sure that no two are the same. You can also just tie them together with thread or ribbon, then cover the table cloth with thin clear plastic to keep it nice. 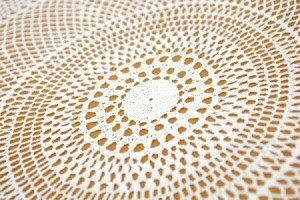 Does anyone have or know where I can get a crochet pattern for a round tablecloth? I am looking for a pattern for a crocheted round table cloth. The table is 42 inches across and I would like it to hang over about six or eight inches. Please help. My suggestion is to cheat. That is right, you heard me. I would go to the Dollar Tree and get yourself all the white or ecru doilies I could get, and put one in the middle, placing the rest in the next "row" of the circle, tying each one to the center one with a nice ribbon or pinning it to it for crocheting the attachment later. Then, get the next row on and keep going. In 2-3 hours, with about 50.00 you will have a very nice table cloth. Yes, it will cost you more, but it will save you about 50 hours of work, and that is conservative. Your time is worth a lot more than 1.00 per hour. Another cool idea is to go the thrift shops and get gently used doilies, and put them together for one that is unique in all the world. When it's done, regardless of what method you use, I would go to Walmart or wherever, they sell clear plastic sheeting in 5' rolls, and get enough to cover the top and at least 2-3" on the sides, to keep it clean. 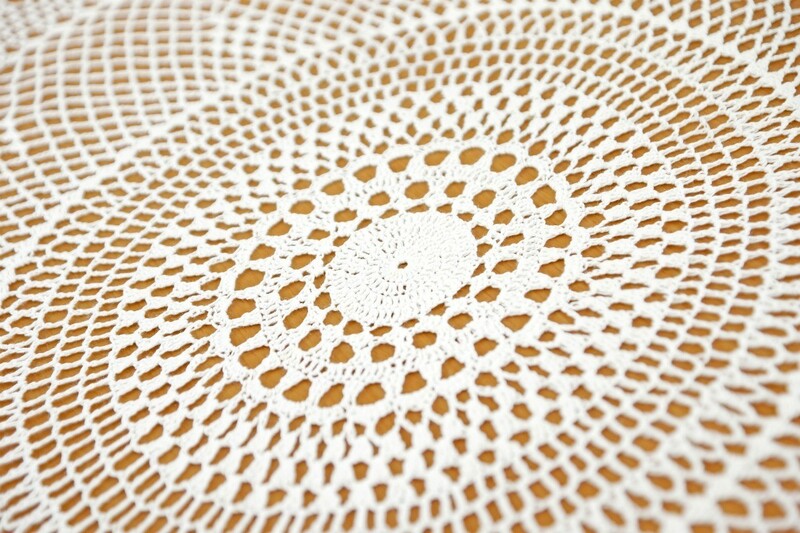 I am looking for a crochet table cloth pattern for a round table that is 42 inches in diameter. Can anyone help me out? Ronnie, the size of the tablecloth you want will be the size of the table plus an 8 to 16 inch drop, depending on whether your table is casual or formal (longer is more formal), and whether you plan to put your lace over a solid round. That means that to the size of the table (42 inches) you'll add 16 to 32 inches, for a total finished diameter of 58 to 74 inches. It is also considered OK to use a square lace tablecloth over a solid round of the appropriate size, if you are setting four places at the table. The size of the cloth will also depend on your hook and thread size, and on your gauge. Be sure to block to size (instructions for blocking are everywhere online). Hope I am not too late getting this to you. I've made this one and love it. Actually, I loved it so much I donated it to a senior's club to draw tickets on. I've made 5 different ones now, but I still do not own one myself. But one day I will. It takes a bit of time but well worth it. Good luck!